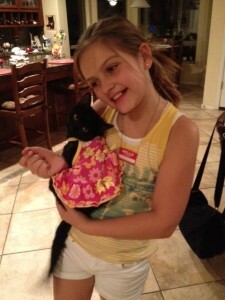 You are here: Home / Pet Stuff / Weekly Pet Pic: Fashion Feline….or a Good Sport? Weekly Pet Pic: Fashion Feline….or a Good Sport? Today’s pet pic is of our little Lucy girl. If you have been following my website, then you know that my daughter adopted a little black kitten from the shelter, through Petco, back in May. Lucy LOVES her Mama and lets her do just about anything she wants to with her. 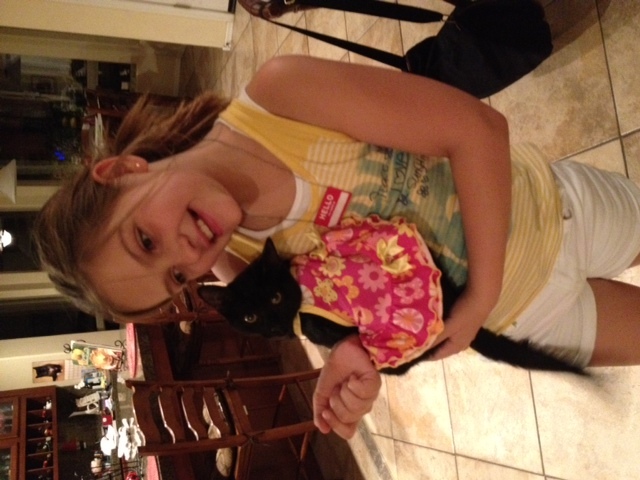 See what I mean in the picture below….and I ask you, is Lucy a fashion feline or just a really good sport?! Although I think she looks really adorable, she was being a good sport because as soon as we snapped the picture, she meowed, asking her Mama to take the dress off! I have to say again, as I’ve said before, that black cats are awesome! She is super sweet and is great with the kids (as you can see)! So if you ever have the chance to adopt a black cat, consider it…because our little Lucy is not only a looker (like in this picture), but she is a lover, too! Email us your pet pics! Send to rachel@managedmoms.com. We love to get them and post them every weekend. Have a great weekend, everyone!